Great for throwing and grappling martial arts, made of 2" thick density foam which provide maximum impact absorption. 18 oz. blue vinyl coated nylon mats with Velcro (V-4) on all four sides allow for a continuous row or area of mats to be laid out in any direction to meet your needs. Excellent as permanent, partial or temporary floor studios or demonstration sites, fully portable folds away easily into 4 sections for storage. 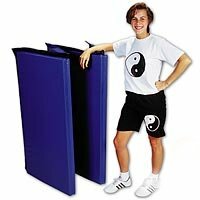 Great for throwing and grappling martial arts, made of 1-3/8" thick density foam which provide a firm surface and impact absorption. 18 oz. blue vinyl coated nylon mats with Velcro (V-4) on all four sides allow for a continuous row or area of mats to be laid out in any direction to meet your needs. Excellent as permanent, partial or temporary floor studios or demonstration sites, fully portable folds away easily into 4 sections for storage.